Brooklyn Jazz Underground is back at it again! The team launched their monthly musical series to highlight one of America’s original art forms: jazz. Their inaugural performance was at the Prospect Range in Brooklyn. Brooklyn Jazz Underground is an alluring and cooperative group of independent musicians from Brooklyn who are committed to their craft. The talented group started making a name for themselves in 2005 and believed Brooklyn was a great place to start on their musical journey. Audience members enjoyed listening to various musical pieces from BJU, while having a glass of wine provided by the Juice Box . BJU started their segment with the David Smith Quintet, a dynamic group that has been playing together for some fifteen years. The quintet includes saxophonist, Dan Pratt, guitarist, Nate Radley, bassist, Matt Aronoff and drummer Anthony Pinciott. As a solo trumpeter, Smith has also released three albums of original music and has contributed to fifty recordings with Columbia , EMI, Motown, Fresh Sound, New Talent and Brooklyn Jazz Underground Records. The party continued with the second act of the evening, the Tammy Scheffer Sextet. 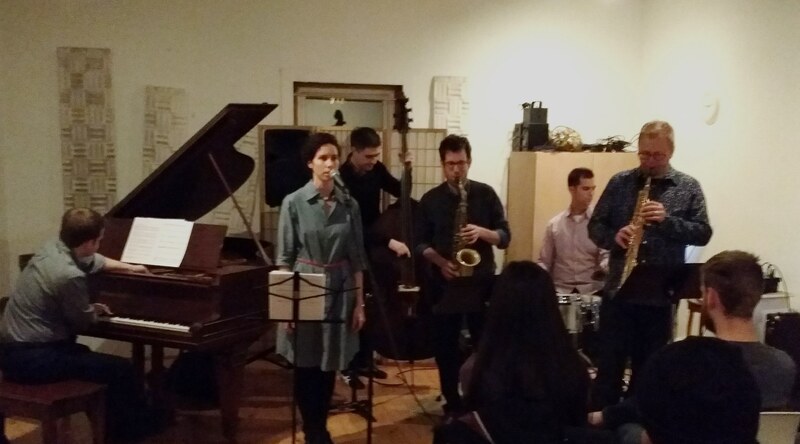 Scheffer performed with saxophonists, Uri Gurvich and Dan Pratt, pianist Bilyl Test, bassist Peter Salvov and drummer Ronen Itzik. As international artists, the sextet has performed in China, England, Spain, and the United States. The audience was intrigued by Scheffer’s voice , which demonstrated why she is an eminent vocalist. The original tempos from each of the performances were a combination of upbeat tempos and ballads that enriched the audience’s soul. Once the music started , it created a serene atmosphere , as BJU’s music exemplifies originality and creativity. The Brooklyn Jazz Underground’s performance reminded the concert attendees why jazz is one of the most significant and influential musical genres.